LOS ANGELES - Jan. 10, 2019 - PRLog -- Dietary supplements are boosters to health. They fill the gap in nutrition while protecting the body against diet slip-ups from time to time. The entire line of Youth Shine portable dietary supplements, encompass Youth Advance, Charm Max, Body Ease, and Night Fix. These Premium dietary supplements serve as a backup to empower body and spirit. Youth Shine Youth Advance Antioxidant Formula is based on the understanding that everyone desires to be healthy and fit. It's no surprise that taking antioxidant dietary supplements like Youth Shine Youth Advance helps to harmonize the multiple interconnected systems that influence good health. Youth Shine Night Fix for Holistic Nutrition helps in achieving optimum wellness. The high grade Nutrition Formula is an essential supplement to be used daily. It is high in B vitamins which are crucial to maintaining the normal function of the brain and nervous system. Also, B vitamins play an essential role in the formation of red blood cells and the regulation of DNA. Other natural ingredients in Night Fix include Astaxanthin, Ginseng extract, milk thistle extract and Echinacea extract. Youth Shine Body Ease Detox Dietary Supplement is a detox formula which re-energizes body and mind. It is an excellent supplement with both short-term and long-term benefits. Body Ease contains selected natural extracts that help maintain intestinal function and promote a healthy digestive system. This blend of Phytonutrients also helps support the liver function, metabolism, immune system, and overall well-being. Youth Shine Charm Max Collagen Formula is a proactive choice that is ideal for sun exposure, high-sugar diets, and smoking, which are big contributors to the decreased collagen level in the body. People dream of firm, flawless and supple skin. This is why individuals are opting for Charm Max collagen supplement for an extra boost. Charm Max is a natural bioactive collagen formula. The clinically-tested Peptan and ApplePhenon together with the herbal blend (olive extract, German chamomile extract, hawthorn extract and ginger extract), help boost collagen synthesis, skin hydration and skin whitening. 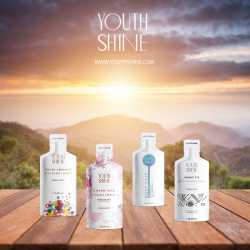 Youth Shine combines the best of nature and science to present remarkable products which help establish the foundation for a healthy lifestyle building on blocks of healthy and basic natural nutrition. All products are crucial to offer the body a holistic environment to function and perform at its optimal level. Office Chairs- Types; Which One To Choose?